A public lecture by Professor Thomas Serfass, Professor of Wildlife Ecology, Frostburg State University. To most North Americans and Europeans otters are highly esteemed for intelligence, playfulness, and attractiveness. These qualities have contributed to otters receiving considerable research and conservation attention in North America and Europe. Additionally, such favourable attitudes and otters’ dependence on aquatic habitats offer potential for otters to serve as an aquatic flagship species to promote aquatic conservation. However, little is known about public attitudes towards otters outside of North America and Europe, and characteristics of a species that engender support from the public vary considerably among cultures. Dr Serfass developed a 5-point conceptual model/approach comprised of 5-elements to serve as a basis for evaluating and developing an aquatic flagship species based on ecotourism: 1) presence at tourist-focused areas; 2) viewing opportunities—when, where, and how; 3) public support & tourist/tour operator interest; 4) public education and involvement, and 5) promotion of long-term persistence/ monitoring. In this lecture Professor Serfass will review research outcomes and conservation experiences related to the North American river otter (Lontra canadensis) in the Greater Yellowstone Ecosystem, USA and the spotted-necked otter (Hydrictis maculicollis) in Rubondo Island National Park, Tanzania to demonstrate the potential for the model to be applied in developing these species as aquatic flagships. He will also discuss potential challenges likely to be imposed by differing environmental, cultural, economic, and wildlife conservation policies/systems. Additionally, he will identify virtues and liabilities in using a game species, such as the river otter, to promote a holistic environmental agenda (in this case aquatic conservation) by contrasting it to the preservationist approach often followed by government agencies. Professor Tom Serfass is Professor of Wildlife Ecology and former Chair in the Department of Biology and Natural Resources at Frostburg State University, and Adjunct Professor at the Appalachian Laboratory – University of Maryland (College Park) Centre for Environmental Science. A large portion of his research and conservation activities focus on the design, implementation and evaluation of wildlife restoration programs and recovering wildlife populations – particularly mesocarnivores. 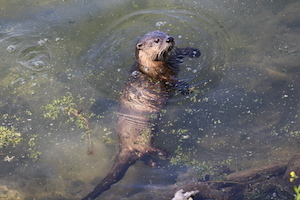 Tom conceived and coordinated the successful Pennsylvania River Otter (Lontra canadensis) and Fisher (Pekania pennanti) Reintroduction Projects. Tom is the North American Coordinator and African Co-coordinator of the International Union for the Conservation of Nature and Natural Resources’ Otter Specialist Group.